Hi Stef, I just purchased your class on Python. At the end of chapter 7 Variables and Floats, you mention "now on to the quiz". I when to next video no quiz, where are they stored? Ahh .. yes. 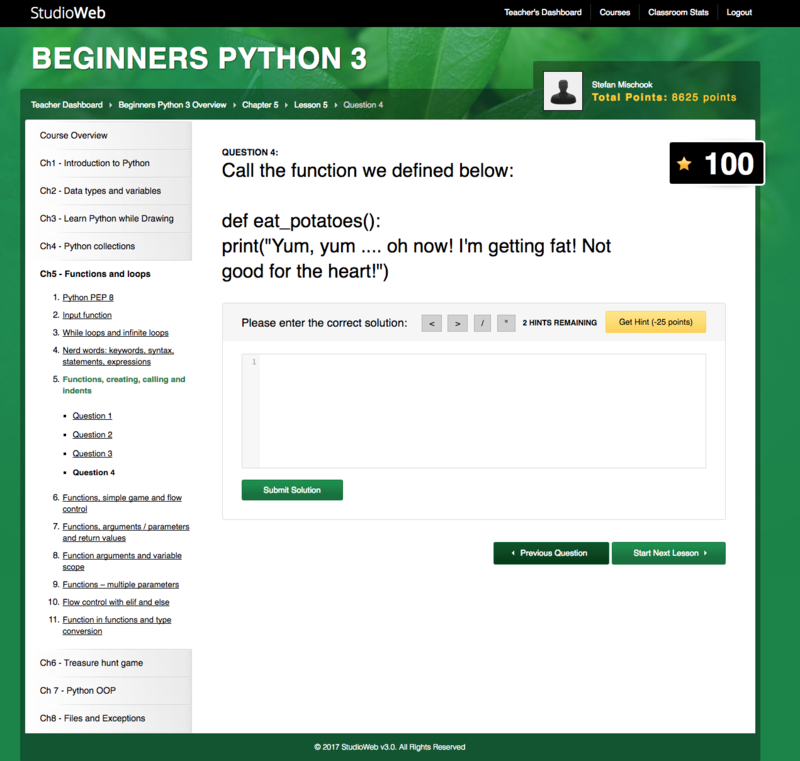 The Python course in StudioWeb has quizzing ... so I mentioned the quizzing. Email directly if you want StudioWeb.com access with all the quizzing and gamification. How are you liking the python course so far? 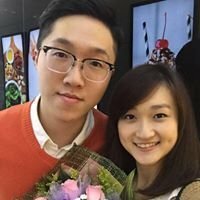 I see, is it better to learn from StudioWeb.com or just follow the videos? If there isn't a significant difference and following the videos and it is faster then I am ok without the quizzes. I will follow your recommendation. The class is very easy to follow and straightforward so far. Some people prefer the quizzing while others prefer the openness of just having the videos. Check out the image of the StudioWeb quizzing. Hello! I'm new to the Python course and I'm really enjoying how straightforward it is overall. I too would like access to the StudioWeb courses if possible, I'm really curious about how I would do on the quizzing. Email me, and I will set you up for the quizzing. Due to getting the notice about my employment termination recently, I’ve started to point my interest more towards the possibility to gain some skills in automation of things, more than just developing/designing mechanics. Me being an old fart, age 50 plus a couple, I guess my only way back into the loop again is by getting some more skills under the belt. With both some Arduinos and RPi’s (for 3D printer purposes) in the house I’ve been browsing, looking for “the perfect tutorial” for both Python and Arduino C-ish. So, when I by accident got a glimpse of your Python-Vlog on YT yesterday, I knew it was the right path. I payed and DL the course directly without hesitating. Thanks a lot for this opportunity! You’ve done a superb job pulling this course together. BTW, I’ve seen posting regarding a challenge and a quiz on StudioWeb, and you want an e-mail being sent to you for gaining login/access to it, can I use the embedded PM/mail function in this forum or do you have some other mail address that you prefer being used for the purpose? Sure, send me a DM and include your email address and I will get you into the StudioWeb Python course. Thanks for picking up the course. I am a fresh recruit in the Python course ( I made up my mind after checking some or your videos on Youtube). Did not have the time to check many videos, but I like what I've seen so far, plus I think you know how to transmit ideas. Great. I am interested in the quizzes/Studioweb course ( I sent you an email as a request on saturday, but I guess you receive many emails or prefer to be contacted over here before). I am having a little technical issue with video lesson # 27, can not open it, although I downloaded the module twice. will try again to see if next time lucky happens. I will set you up with the Python quizzing in 10 minutes .... check your email. I recently purchased your Python 3 course and first of all thanks for a great course! I'm in my thirties and decided to go for a career change, hence the interest in programming. So far I passed two edx java courses by Microsoft and that wasn't easy... I like your course a lot - the way you explain things really gives me hopes that I could one day become a programmer. Could you give me access to StudioWeb quizzes, don't want to miss the opportunity to practice. Thank you in advance! Glad to hear you like the course. I've just sent you access to the quizzing. I was wondering if I could also get access to the quizzes for the Python course material? Sure thing, send me an email at: stefan at killersites.com. I also bought the Python course recently and would like access to the quizzing as well.